Our first night in Singapore was spent walking around in the jungle, dark, tired and sweaty, but all those creatures at the Singapore Night Safari kept us interested and excited - we actually stayed until they needed to close. Lol! We arrived at the Changi Airport in Singapore late in the morning on a Saturday. Our plan was set - have lunch, go home to drop off our bags, go to Orchard Road to change some money, visit the Raffles Hotel for some original Singapore Sling, then off to the Singapore Night Safari! ~ Wear something light and cool, shorts are allowed at the park. ~ Wear walking shoes. Yes, there will be a lot of walking. A LOT of walking. 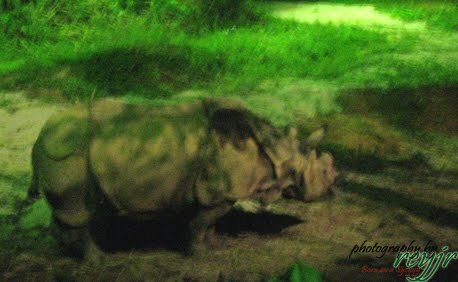 If you do intent to commute, the easiest way is to take one of the chartered buses that will take you directly to the Night Safari. From the city, buses begin at 6PM. 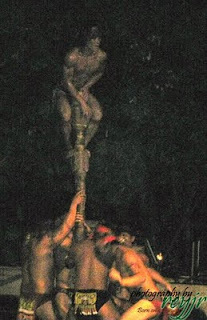 For the location and schedules, visit the Singapore Night Safari Website. The park opens at 7:30PM, but the shops and restaurants open at 6:00PM. Make sure you leave some time for lining up for your tickets (there's always a long line). Also, reserve some time to browse around the shops for souvenirs. The park closes at 12midnight, almosright after the last Creatures of the Night Show - more on that later. We arrived at around 8PM and lined up for our tickets. Entrance fee is S$22.00 (or approx Php660.00) for adults and S$11.00 (or approx Php330.00) for children 3 to 12 years old. You will also have an option to take the tram tour with a tour guide. This route takes you all the way around the whole park, but stops only briefly at certain points. If you are able to walk for longer than you usually walk (lol) I would recommend you take the foot trail instead. ~ The best time to arrive there would be around 7PM. That will give you ample time to have a relaxed pace and see the whole place before the final Creatures of the Night Show. ~ Taking the foot trail would give you more time to look around and watch the animals walk around, eat, hunt or just lounge around in their natural habitats. Plus it's great exercise. We asked if we were allowed to bring food inside the park and they said we were, but remember to be careful and avoid attracting the attention of the animals because they'll be able to smell the food (or maybe because WE are the food lol). There are several restaurants available there, a couple for a good sit down meal, and a couple more of fast-food type foods like burgers and fries. They're a bit pricey though, so if you can, better have dinner before going to the Safari. I would recommend going for one of those Food Republic places. Ah yes. It's very similar to our local SM Food Courts, only more stores with different Asian Food. ~ Have dinner before you go to the Night Safari to have more time to walk around and enjoy the animals. ~ If you do bring food inside, share - but not with the animals. Lol. 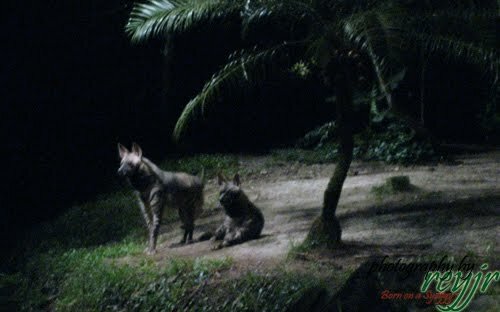 Another free show, the Creatures of the Night Show is a MUST SEE when you visit the Night Safari. The do the show daily at 7.30pm, 8.30pm, and 9.30pm with additional shows at 10.30pm on Fridays, Saturdays and eve of public holidays. ~ If you take the foot trail, give yourself time to walk back to the venue of the Creatures of the Night Show - remember, you will still need to line up for it. Visit the Bridge of Suspense right before the Malayan Tigers, go around the west loop (to your right when you enter) to see the Elephants and Anteaters, go straight to the end of the East loop for the zebras and giraffes. There are a lot of interesting facts and trivia about each animal posted around as well. ~ DO NOT USE FLASH PHOTOGRAPHY. It annoys the animals and it annoys me. lol. ~ The walking trails are circular - keep the map handy in case you get lost. ~ Watch out for mosquitoes! ~ Bring a small umbrella in case it rains, although that is seldom. 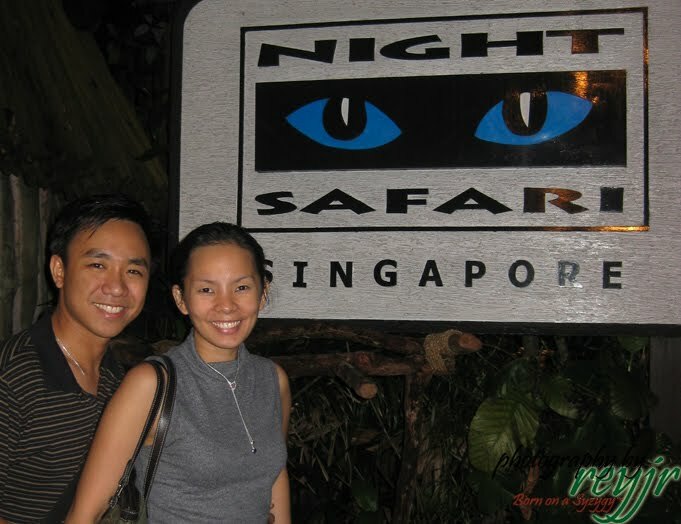 Enjoy your trip to the Singapore Night Safari!